The Compulsive Reader: Looking Ahead: Alethea Kontis and Enchanted! 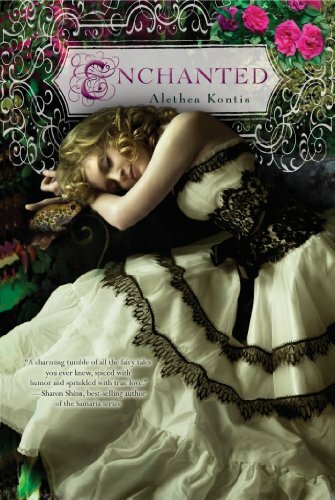 Today I have Alethea Kontis and her magical book Enchanted on the blog! AK: Every fairy tale you know came from the Woodcutter family. TCR: What's the best thing so far about being a published author? AK: The absolutely amazing friends I've made all over the world. To think, they were once complete strangers! AK: I was torn, to be perfectly honest. On the one hand, I LOVED it. It's a freaking gorgeous cover. I want the font and the dress, in that order. The other hand reminded me that it wasn't my original title, and it wasn't art by John Jude Palencar or K.Y. Craft...but a girl has to have goals, right? AK: You can stay up with everything I do at www.aletheakontis.com. There is a special page dedicated solely to ENCHANTED and all the relevant reviews, interviews, and Easter Eggs at: http://aletheakontis.com/about/enchanted Which reminds me that I need to post about the audiobook sale of ENCHANTED to Brilliance Audio...woohoo!! Thank you so much, Alethea! Read on to learn more about Enchanted, which will be out on May 8th, 2012! "It isn’t easy being the rather overlooked and unhappy youngest sibling to sisters named for the other six days of the week. Sunday’s only comfort is writing stories, although what she writes has a terrible tendency to come true. The prince returns to his castle, intent on making Sunday fall in love with him as the man he is, not the frog he was. But Sunday is not so easy to woo. How can she feel such a strange, strong attraction for this prince she barely knows? And what twisted secrets lie hidden in his past—and hers?" This is an absolutely beautiful cover! It makes me want to pick it up immediately.